Don't you love the new Penny Pincher booklets? All those Super Coupons and Penny Pinchers? This month's book is outstanding. I found that I used more Penny Pincher coupons this month than I have in many. If you are new to our stores, Penny Pincher coupons are store issued coupons. The price of the item is listed on the coupon instead of the amount you take off the item. These coupons can be matched up with a corresponding manufacturer's coupon. This allows County Market shoppers unique opportunities to save more money than shopping at other grocery stores. 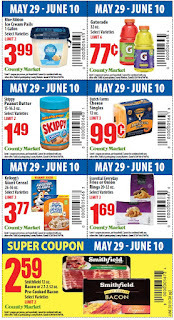 Each month you will have access to Penny Pinchers by bulk mail, free at customer service, and visible online at mycountymarket.com This allows coupon shoppers opportunity to scan their coupon stashes to find the best PP MF coupon matches. When you use both, your savings is over 50% on the item. 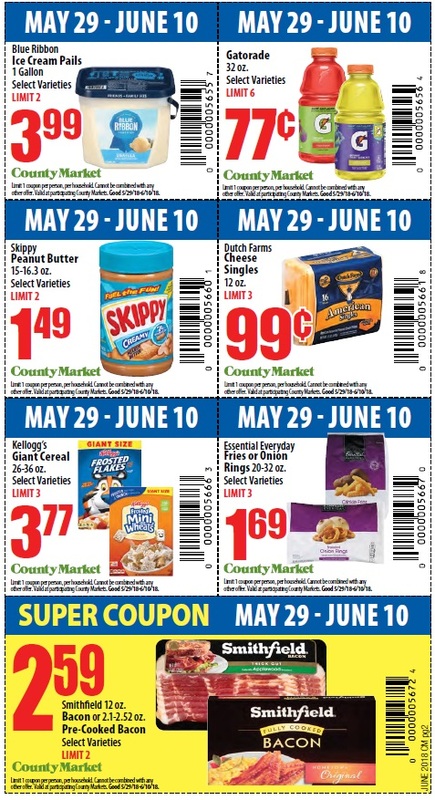 This month for example, Nabisco, Unilever, Kelloggs, and Smithfield all have manufacturer coupons that can be matched up to the items for additional savings. Once you gather your coupons, all you need to do is scan your max card and hand your coupons to the cashier. They will scan each one, and the Manufacturer coupons and your prices will be adjusted, and the coupons deducted off your bill. It's so much fun watching that coupon countdown. Have you seen a countdown in action? Here's a link to my June PP trip.